How can I follow that? Well, I won’t even try. Luscious song, hypnotic beat, gorgeous, talented band. They inspired this lazy, easy breakfast. To be served to someone you love. That includes you. For a real treat, click on the link and listen while you dine. Don’t be put off trying this if you can’t find the large mushrooms. Just get five brown mushrooms (or brown and shiitake), halve or quarter them and cook as described. 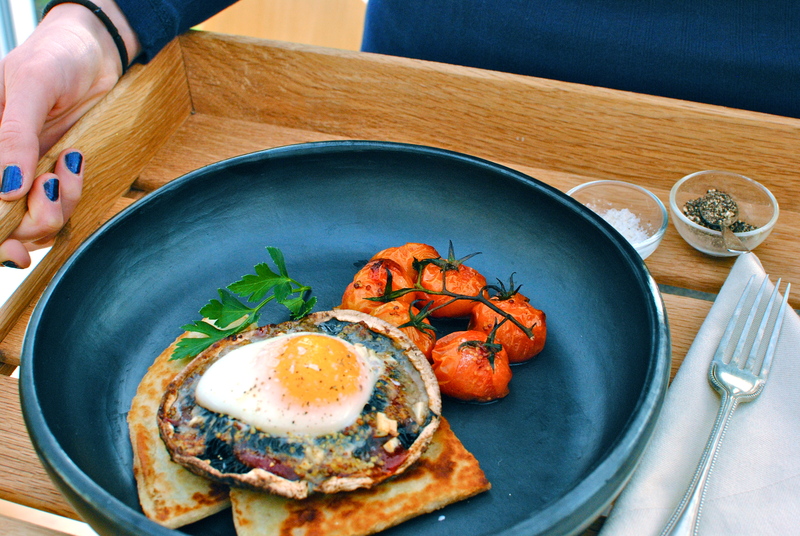 When it is time to add the egg, just drain off the mushroom juices, dot over the condiments and garlic and then make a little ‘nest’ in the mushrooms; pop the egg on top. The egg white will amalgamate with the juices and oil in the pan, but it will still taste brilliant. Rub a little olive oil onto the vine tomatoes and the bottom and sides of a baking dish. 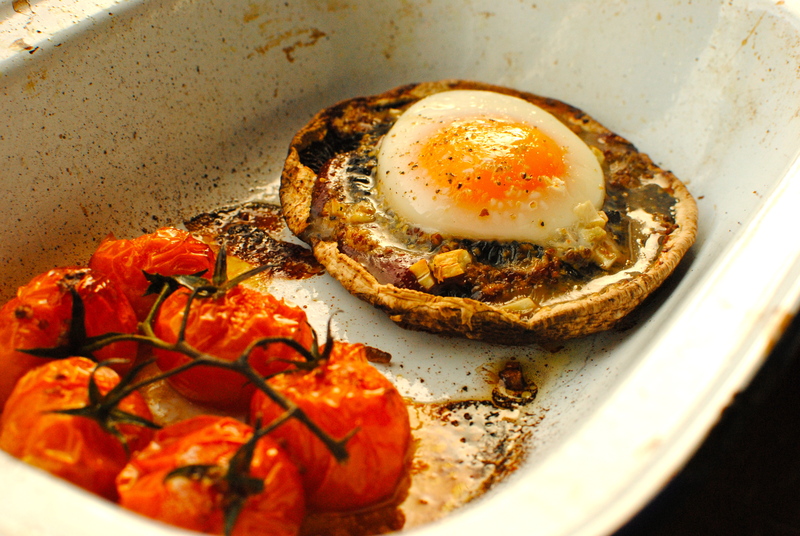 I used an enamel pie dish but anything to snugly cosset the mushroomy egg, and the tomatoes, will do fine. Brush off the mushroom and, with a teaspoon, scoop out a suitable little hole to hold the egg yolk. But don’t put the egg in just yet. Pop the mushroom and tomatoes into a 200C/400F oven and bake for 10 minutes. When time is up take the dish and tilt it slightly to drain the mushroom juice into the rest of the dish where it will evaporate. Now rub a little mustard and ketchup over the surface of the mushroom, but not too much – about tsp of each; dot over the minced garlic and grind over a little pepper if you like. Break the egg into a bowl and with a large spoon (serving spoon size) scoop it up and place it gently onto the mushroom. Put the dish back into the oven for 8-12 minutes, depending on your oven and how you like your egg. Have a look at it around the eight-minute mark. You will probably find that the white is still translucent in places. Just cook it until this is just white, otherwise the yolk – because it has a higher fat content than the white – may cook too much. Mine was perfect at 10 minutes. If you are having the potato scones, heat a small pinch of butter in a pan and, when foaming, turn the heat down a little and add in two potato scones. Cook until lightly browned on both sides. No ‘tattie’ scones (poor you! ), well this is fabulous with wholegrain toast. 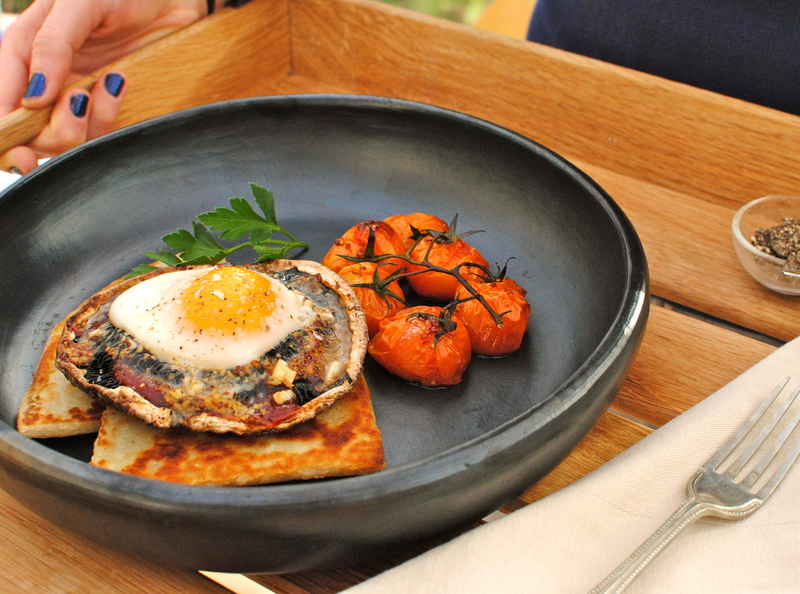 Serve the egg-topped mushroom with a light scatter of flaky salt, buttery potato scones/toast and the fragrant tomatoes. How’s that for an easy all-in-one breakfast? This looks delicious….and I love Train! How novel an egg in a mushroom. 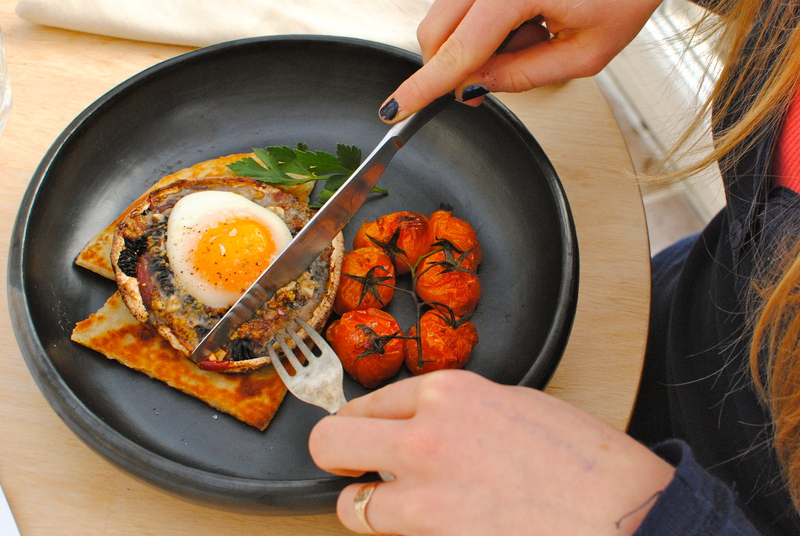 I will definitely try that next time we have a cooked breakfast – which is generally every weekend because it is one of my favourite meals and cooked, in the right way, really healthy. I often use shitake mushrooms and cooking the egg on them will really pep up the taste. I’m hooked on the song too! That looks good. I hate tomatoes on the vine, so I will have to leave them out. May be nice on a slice of good quality black pudding instead of the potato scones. Stornaway black pudding *and* potato scones would be my husband’s choice. If he was allowed a choice! Yum, this is definately not just for breakfast! You are absolutely right. Miss R and I had it for lunch yesterday, and filling it was too! This sounds lovely! I am using up what is left in the fridge before our trip & guess what? 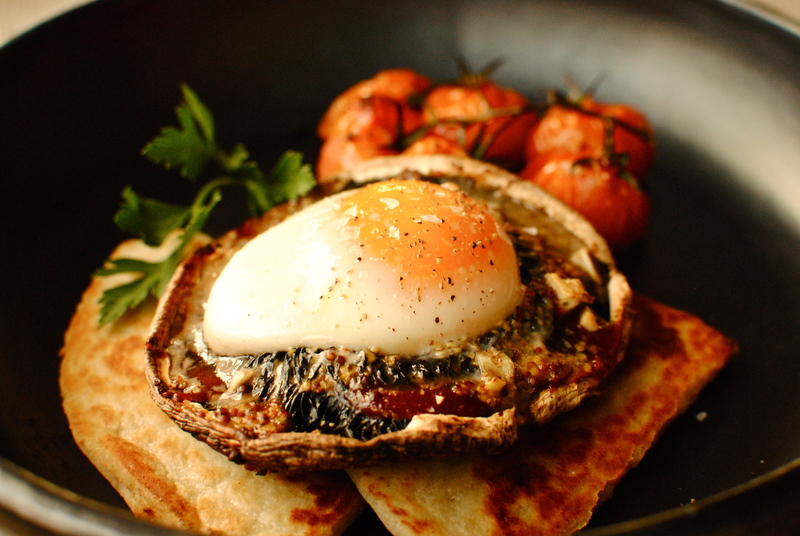 We have eggs & portobellos, yay!! I love your photos. 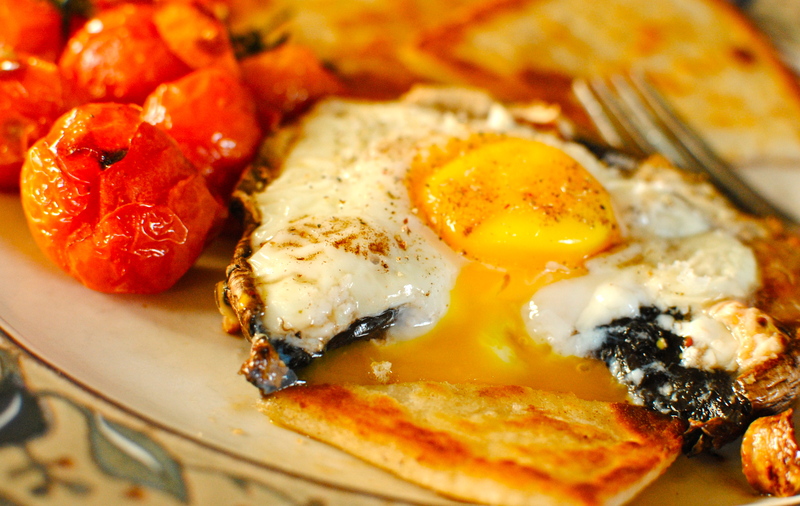 This one is a must try since I love eggs and I love mushrooms. Thanks! Gosh that does look good. I could eat that right now! This looks super yummy. I will have to try it soon! Love Train! how have I never heard this song before?? 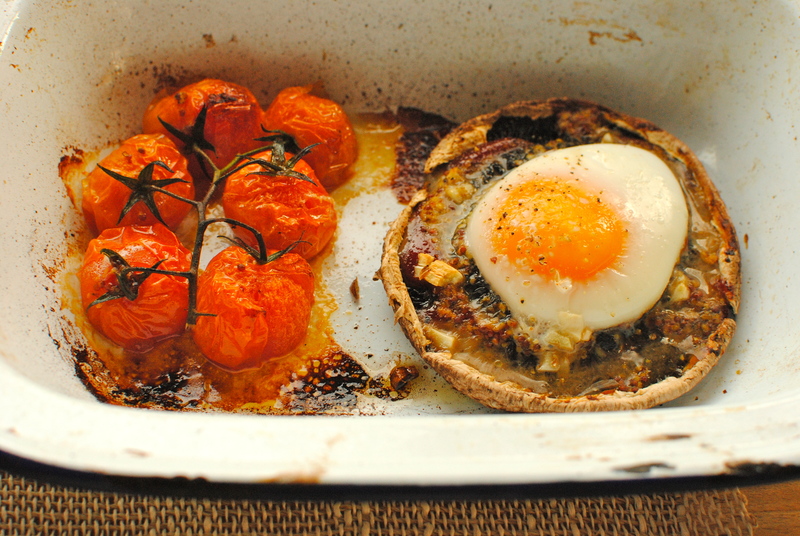 Love baked eggs too, and what a fabulous idea to bake them in a portabello mushroom! 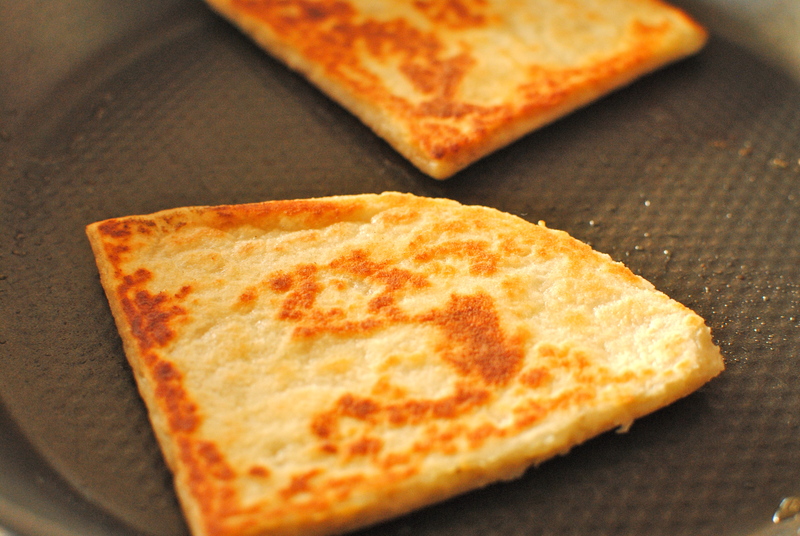 Potato scones? Never heard of such a thing. but I’d love to try them! Will be making these baked eggs for sure! Yes, I would very much like to eat this, and your food photography is amazing! That looks amazing!!! I can’t wait to try it!! Yay! the return of the beetroot! Sam has just had your ‘juice of the week’ on the way to boxing club and he feels all energised zinged up, thank you. It look so fantastic! I’m a big fan of any mushrooms! I can’t wait! 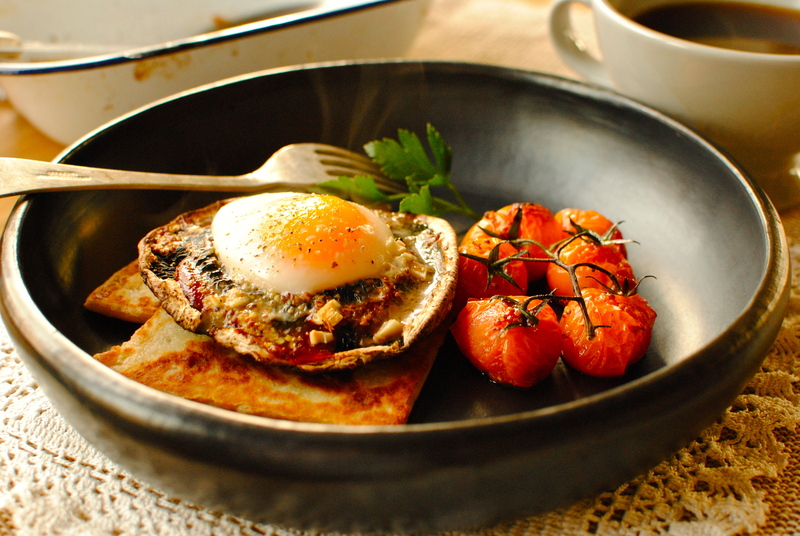 I think I’m going to try this (egg and mushroom) for breakfast today. I’m not sure ill like it although I do like the ingredients separately. 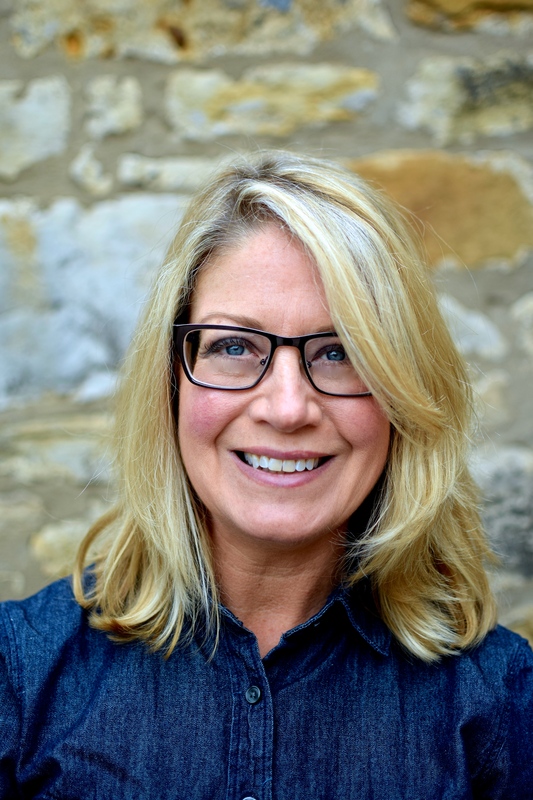 This blog has lots of interesting choices. Now if only she could come to my house (or send me) and make some dishes for me to try. Lol.